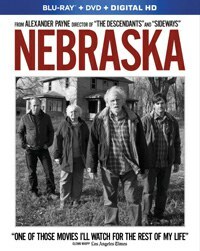 Nebraska is a bittersweet film that will hit you between the eyes if you're like me: middle-aged and in a mood to reflect on where life has taken you and where you will go next. My mother died last year after a life troubled by decades of mental illness, and I spent much time with my siblings and my father before and after the funeral. Because of that relatively recent experience, and because I am middle-aged and contemplative, Nebraska struck me to the core. Not all movies do that, and I can imagine I would have reacted to it much differently had I been 20 years old, but sometimes a film speaks to you at just the right time in your life. This one did. Nebraska stars Bruce Dern as Woody Grant, who is retired but restless. When he receives a letter saying he may have won $1 million, he decides he has definitely won the prize and sets out to walk to Lincoln, Nebraska to claim his money, since he can't drive and his wife and two sons won't take him there. After a police officer finds him on the side of the road and returns him home, his son David (Will Forte) decides he will take time off from his job selling audio-video equipment and drive his father to Nebraska. Woody's wife Kate (June Squibb) thinks they're both crazy but relents. Meanwhile, David's brother Ross (Bob Odenkirk) can't just drop his burgeoning career as a local news anchor but says he'll try to join them in Woody and Kate's hometown of Hawthorne, Nebraska, where a family reunion is planned. David sets out on the road with his taciturn father, thinking that this will be a good opportunity for them to repair what has always been a troubled relationship that wasn't helped by Woody's alcoholism. After several incidents, they arrive in Hawthorne, where much of act two takes place. Kate and Ross arrive and we're introduced to the extended Grant family, few of whom have amounted to much of anything. We also meet Woody's ex-business partner Ed Pegram (Stacy Keach). The cast is stellar, particularly Dern, whose role required few words but much more said through facial expressions. Squibb is enjoyable as his wife, a woman who says everything that pops into her head, no matter how crude (she delivers many of the laugh-out-loud lines in this bittersweet film), and Odenkirk handles his role well. I have to admit that I was skeptical about Forte, since I had pigeonholed him as just a former SNL guy who makes funny movies, but he nails the part of David, bringing an earnestness to the role that underscores his position of an underachiever who is trying make sense of his life. Nebraska's black-and-white photography also helps sell this story, with its sparse shots of wintry landscapes and rundown towns still clinging to the vestiges of their former glory. As director Alexander Payne explains in the 28-minute making-of featurette also found on the disc, trying to make a black-and-white movie was a struggle, especially since he and the producers had agreed to terms with Paramount before telling the studio that it wouldn't be in color. That little bombshell required a whole new discussion that threatened to derail the production; thankfully, Payne won that argument. The featurette also delves into the other major areas of production, starting with Bob Nelson's screenplay, which was the first one he ever wrote, and Payne's desire to make it. The casting section covers the major roles but leaves out something my wife and I were wondering about: Were the many minor roles filled by locals to give the film more authenticity? It seemed that way, given their flat Midwestern deliveries of lines, but it wasn't discussed. Unfortunately, that's it for extras on this Blu-ray. I imagine that Paramount wants to see how well Nebraska does at the Academy Awards before deciding whether to do a more in-depth edition. The package also includes a DVD with just the movie as well as a code for a digital copy. Thankfully, iTunes is an option, so if you dislike Ultraviolet as much as I do, you'll appreciate that.